Mr Campion’s Farthing was the first novel to be written by the journalist and artist Philip (‘Pip’) Youngman Carter following the death of his wife of almost 40 years, Margery Allingham. From his first appearance in 1929 Albert Campion became one of the most admired and best-loved fictional detectives of the ‘Golden Age’ of English crime writing, alongside Agatha Christie’s Hercule Poirot and Dorothy L. Sayers’ Lord Peter Wimsey. Unlike his contemporaries, Campion was allowed to develop and age by his creator in an adventurous career which was still going strong in 1966 when Margery Allingham died during the writing of Cargo of Eagles. 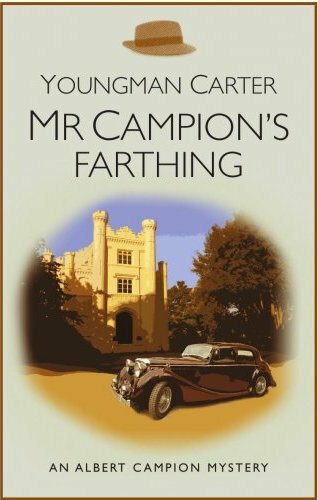 Youngman Carter, who had co-operated with his wife on many of her books (as well as designing the dust jackets), completed that novel and went on to write two more, Mr Campion’s Farthing and Mr Campion’s Falcon, before he died in 1969. Ostara is proud to reissue both of Youngman Carter’s books with the help of the Margery Allingham Society, which celebrates its 25th anniversary in 2013.